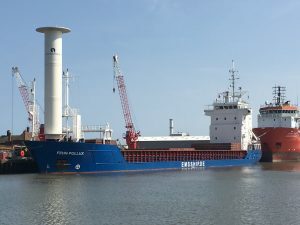 The rotor-vessel FEHN POLLUX is alongside in Great Yarmouth/UK today. She is discharging a cargo of wheat she loaded in La Pallice/France. After three weeks in service the Flettner rotor is doing well and first experiences show, that the sailing device is definitively saving fuel.